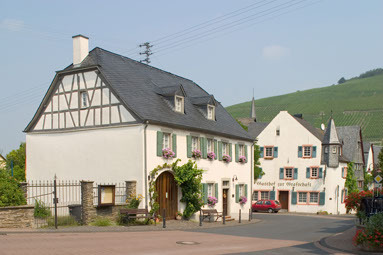 Veldenz is a small wine-producing community set in one of the most beautiful valleys in the Hunsruck mountains, not far from the town of Bernkastel-Kues. The village of Veldenz dates back over two thousand years, and has recently been voted the best-kept village in Rheinland-Pfalz. The surrounding area is one of outstanding natural beauty, and is an ideal area for a cycling or walking holiday.